The Wild Pack Band: Wild Pack's "Meatloaf Jam"
Wild Pack Hosts "Meatloaf Jam" at Mama Bears Pizza in Punta Band BC. Come out and enjoy the coolest cats jamming the Blues every Monday. 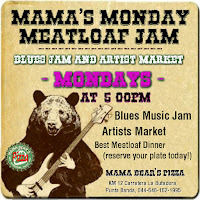 Everyone is welcome at the weekly "Meatloaf Jam" every Monday on the back-patio stage from 5PM to 8PM at Mama Bears Pizza. Don't forget to order the famous Mama Bear's Meatloaf Dinner just like mom makes...wait Mama does make it!